The city was founded in 1903, at a time when modern-day Alberta and Saskatchewan were still part of the Northwest Territories. The provinces were created later with a boundary at 110° west longitude, right down 50th Avenue (Meridian Ave.). By 2011 the city had 27,800 people; principal local industries include agriculture and oil refining. Due to differing sales tax structures (Alberta has no provincial sales tax) and time zones (Alberta observes Mountain Daylight Savings Time seasonally, Saskatchewan keeps Central Standard Time year-round), Lloydminster and its immediate trading area are part of Alberta's time zone and its businesses follow Alberta's sales tax rules. 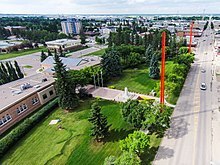 A 163-bed hospital in Saskatchewan serves both provinces; the city's Lakeland College campus is in Alberta and the local airport (YLL IATA) moved from Saskatchewan to Alberta in 1981. Saskatchewan addresses may be identified by their postal codes (which have a leading 'S') and telephone area codes (usually +1 306, sometimes +1 639). There is no bus service to Lloydminster. Lloydminster is on Yellowhead Highway 16 at roughly the halfway point between Saskatoon and Edmonton. The highway is divided for most of this route (except for the portion within Lloydminster itself). A second highway, Highway 17, runs north-south through the city, but is primarily only a local route. 53.310556-110.0741671 Lloydminster Municipal Airport (YLL IATA), 8301 75 Street. M-F 7am-6:30pm. A local airport with one 1700m asphalt runway hosts Central Mountain Air's weekday scheduled flights to Calgary. Edmonton and Saskatoon offer the closest international airports to Lloydminster. Lloydminster has no public transit. Edmonton and Saskatoon are both approximately 2.5-3 hours' distant on the Yellowhead Highway. This city travel guide to Lloydminster is a usable article. It has information on how to get there and on restaurants and hotels. An adventurous person could use this article, but please feel free to improve it by editing the page. This travel guide page was last edited at 19:07, on 3 April 2019 by Wikivoyage user MuzikMachine. Based on work by Wikivoyage users Traveler100bot, K7L, AndreeBot, Eco84, Robkelk, Ground Zero, Mx. Granger and Hobbitschuster, Wikivoyage anonymous user 198.161.213.7 and others.